* 2014 CQ WW 160-Meter Contest Scores now online only. Click here for complete scores: CW Scores — SSB Scores. 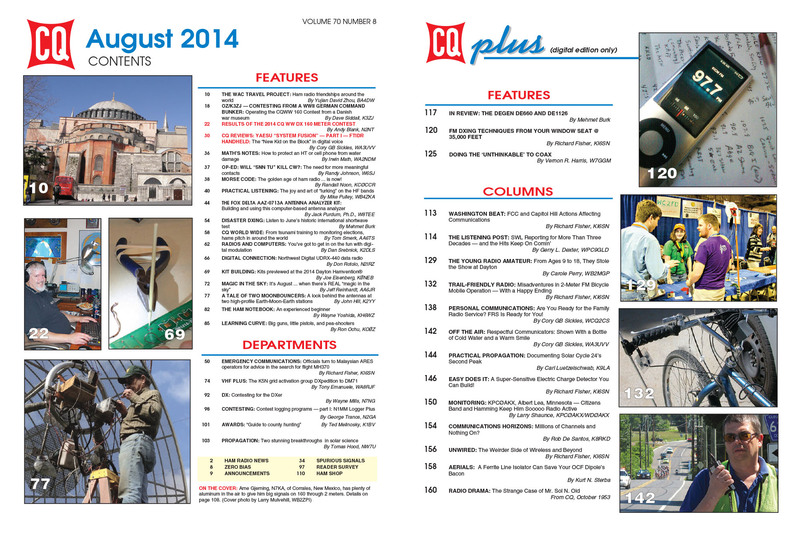 The August issue of CQ is one of those issues that kind of put itself together and told us what it wanted to be. There are three major themes working their way through the issue -- international friendship and cooperation via amateur radio, the growing popularity of digital voice and data modes on the ham bands, and the incredible ability of hams to send signals hundreds of thousands of miles back and forth to the moon. 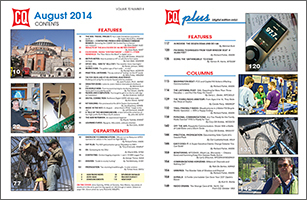 Print readers will also notice a few columns that usually run in the CQ Plus digital supplement. We moved them up because they tie in with other content. Expect more of this in the future. Diving into the issue, we start with BA4DW’s “WAC Travel Project” article, in which David Zhou describes his goal of visiting all continents over the course of two years, and the great ham radio experiences he had on his most recent trip. Next, Dave Siddall, K3ZJ, takes a step into radio history by operating the 2014 CQ World Wide 160-Meter Contest from a World War II German command bunker in Denmark that is now a museum. His article describes his station setup there as well as the help he received from museum officials. The results of that contest are up next, with more great competition among the stations slugging it out for top spots. Once again, complete station scores are online only. Click here to see the complete scores: CW Scores — SSB Scores. The first of our articles on digital voice comes next, as Contributing Editor Cory Sickles, WA3UVV, reviews Yaesu’s “System Fusion” digital voice protocol and its associated FT1DR handheld (reviews of the companion mobile rig and repeater will follow). We jump back to a few features with “Practical Listening,” by regular contributor Mike Pulley, WB4ZKA, who explains “the joy and art of ‘lurking’ on the HF bands.” Next, Jack Purdum, W8TEE, shares his experiences in building and using the Fox Delta AAZ-0713A antenna analyzer kit. This versatile tool keeps the price down by using your laptop to do a lot of the number-crunching and display the results. Back to our columns, Emergency Communications Editor Richard Fisher, KI6SN, reports on help provided by hams in Malaysia and neighboring countries in the still-futile search for Flight 370. “Disaster DXing” editor Mehmet Burk follows with a look at an international shortwave broadcast test in the same part of the world, featuring cooperation between broadcasters in several Indian Ocean nations; and “CQ World Wide” editor Tom Smerk, AA6TS, looks at tsunami training among hams in Indonesia as well as ham radio news from all around the world. Back in the U.S., Kit-Building Editor Joe Eisenberg, K0NEB, previews some kits introduced this year at Dayton (Joe is just back from the HAM RADIO show in Friedrichshafen, Germany, and will report on his experiences there in the September issue). We jump back into the digital voice pool with “Radios and Computers” editor Dan Srebnick, K2DLS, reporting that “You’ve Got to Get in On the Fun With Digital Modulation,” in his introduction to DMR, or Digital Mobile Radio. “Digital Connection” editor Don Rotolo, N2IRZ, follows with a look at a new data radio, the UDRX-440 by Northwest Digital Radio. From the digital to the ethereal, “Magic in the Sky” editor Jeff Reinhardt, AA6JR, takes us skyward to check out the ham radio potential in August’s big Perseids meteor shower. Keep looking up as VHF Editor Tony Emanuele, WA8RJF, reports on the K5N Grid Activation Group's DXpedition to DM71, where much of their focus was on making moonbounce, or EME, contacts. And while we're listening to the moon, we might hear one or both of the “big gun” EME stations profiled in “A Tale of Two Moonbouncers,” by John Hill, K2YY. John is bi-coastal, which has given him the chance to be active with W6YX at Stanford University in California as well as the K1JT/K2UYH EME team “back east” in New Jersey. Before the moon sets, be sure to check out KH6WZ’s "Ham Notebook" column on "An Experienced Beginner," about getting started on EME and microwave communications. Back to Earth now, “Learning Curve” editor Ron Ochu, KO0Z, looks ahead to the fall "contest season" by introducing the three main categories of contesting stations — “Big Guns, Little Pistols, and Pea-Shooters.” DX Editor Wayne Mills, N7NG, stays on that theme with "Contesting for the DXer," and Contesting Editor George Tranos, N2GA, begins a look at various contest logging programs, starting this month with N1MM Logger Plus. Next, Awards Editor Ted Melinosky, K1BV, introduces a “Guide to County Hunting” which he’s in the process of writing; and Propagation Editor Tomas Hood, NW7US, describes “Two Stunning Breakthroughs” in satellite technology for studying the sun and its effects on radio here on Earth. 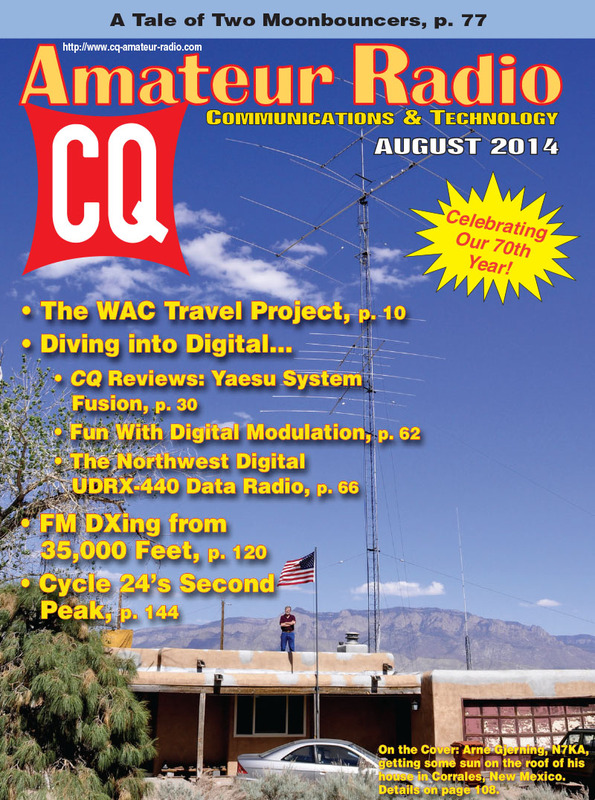 In August’s CQ Plus, the expanded CQ digital edition, you’ll find wide-ranging stories and columns for the communications hobbyist – from shortwave listening news and construction projects to propagation forecasts and a look at how TV may change in the not-too-distant future. In The Listening Post, Gerry Dexter, WPC9GLD, notes he is well into his third decade of bringing you monthly reports on the latest news from the shortwave bands. And this time Gerry enlightens us about the “hidden countries” you may be monitoring regularly – and not even realize it! Krusty ol’ Kurt reminds readers in Aerials that if your RF is getting into all the wrong places, it might be time to consider adding a ferrite bead isolator to your feed line. He explains how to make one easily and inexpensively. In Communications Horizons, Rob de Santos, K8RKD, writes that the Chief Product Officer of Netflix predicts there may be millions of TV channels in another decade. But Rob wonders, will anyone be watching? In August’s Easy Does It, Richard Fisher, KI6SN, shows how to make a “Super-Sensitive Electric Charge Detector” that is super simple, as well. With just four parts, you can have it up and running in no time! Here’s a tip for taking the boredom out of your next airline flight: Do some FM broadcast band DXing from your window seat. CQ Plus Editor Richard Fisher, KI6SN, offers readers tips on how to identify and log scores of stations quickly from 35,000 feet. Off the Air columnist Cory GB Sickles, WA3UVV / WPC2CS, underscores how important it is to be kind and helpful when providing communications during public service events – especially when other people are not. Additionally, in Personal Communications, Cory wonders: Are You Ready for the Family Radio Service? He says FRS is ready for you!Learn about the value and flexibility FRS offers, and how to get in on the fun inexpensively. Skywave guru Carl Luetzelschwab, K9LA, examines Solar Cycle 24 in August’s Practical Propagation. He sees a second peak – something to smile about. In this month’s Trail-Friendly Radio, follow the 2-meter FM bicycle mobiling misadventures of Richard Fisher, KI6SN. Sometimes it takes a few disasters before getting things right. In August, as well, are regular features including Washington Beat, Tomas Hood, NW7US’s, Ham and SWL Propagation Forecast, and the wild and whacky Unwired. That's a brief look at what's coming up in the August issue of CQ magazine, including the digital-only CQ Plus supplement, which we're pleased to report will be back on selected newsstands, specifically at Barnes & Noble, Books-A-Million (BAM) and Hastings bookstores. The digital edition should be in subscribers’ in-boxes by the beginning of August, with the print edition following as quickly as possible. For information on becoming a CQ subscriber - to either our print or digital edition (or both!) - Click Here to Subscribe. On the Cover: Arne Gjerning, N7KA, of Corrales, New Mexico, surrounded by mountains … of antennas!